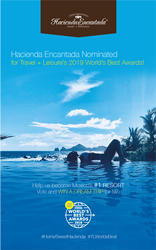 Hacienda Encantada Resort and Residences nominated for the Travel + Leisure 2019 Best Awards. Each year, Travel + Leisure members and readers can nominate their preferred travel providers for Best Awards. Airlines, hotels and resorts, cruise lines; car rental companies and virtually all travel related companies could be nominated to receive these honors. Readers and travelers select these nominees, so those who have traveled extensively make nominations. Properties selected, have met the criteria to be nominated for the Best Awards. Only a select number of these nominations came from the popular Los Cabos region. Hacienda Encantada Resort and Residence is proud to be one of the elite properties listed as a nominee for this distinction in 2019. The destination of Los Cabos is growing tremendously and is home to some of the most exclusive resort and private residential communities in Latin America. With new flight routes arriving in Los Cabos from the US, Canada, and the UK, Los Cabos is on pace to compete with the Riviera Maya and Puerto Vallarta for visitors looking for world-class resorts and vacation fun. Located on the tip of the Baja Peninsula, Los Cabos or The Capes as it translates to is made up of the towns of Cabo San Lucas and San Jose Del Cabo. The two towns on the western and eastern tips of the peninsula respectively, share a tremendous landscape between them, featuring golf courses built by world famous and champion designers, amazing beaches, snorkeling, scuba diving, and world-renowned resorts. Just two short decades ago, Cabo, as it is affectionately referred to was still just being recognized as an up and coming destination. Nowadays, Los Cabos is the place to be for travelers from all over the globe. Deep-sea fishing and golf courses were a large part of what put Cabo on the map, but the desert meets the sea and the beauty the Baja offers, is something truly spectacular and what keeps bringing visitors back. Hacienda Encantada Resort and Residences enjoys an exceptional Los Cabos location, on the corridor between the two towns, but close to Cabo San Lucas. With spectacular views of the Cabo Bay and the famous arch and land’s end, the suites and villas feature incredible sunset and ocean views. With exceptional service and glowing reviews, it is no wonder this resort and residence club, was nominated for the 2019 Travel and Leisure Award. Being family owned an operated; the staff is very attentive and focused on service. These qualities, coupled with the amazing design and prime location, help this exclusive vacation resort, maintain its status as one of the top resorts in the destination, year after year. About Travel + Leisure – Travel and Leisure is a travel magazine with a reader base of over 4.8 million per month. It is based in New York, New York and was founded in 1937. It is released once per month and highlights the very best in the travel and leisure industry throughout the globe. Annually, the World’s Best lists, a favorite feature amongst readers, allow members to cast their votes on their favorites in the travel industry. About Hacienda Encantada Resort and Residences - A luxury resort and residence club located in the exclusive Los Cabos corridor, Hacienda suites provide guests with ocean, Land’s End and golf course views! A collection of restaurants on site, and on the Marina Golden Zone, is ready to provide a wide variety of culinary experiences for guests. On-site, a spa, infinity pools, and activities are perfect for families; couples or groups wanting to relax have fun and enjoy Los Cabos. The hacienda-style architecture combines old world charm, with new world conveniences and luxury finishes. From studio to 4 bedroom suites, there are options for every type of group. Call now or visit our website to learn more.